A creative game that never needs to be put away. Find It is ideal to play anywhere: at home, in the office, in your car. 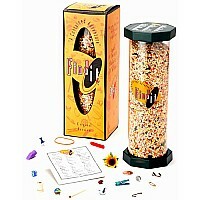 People of all ages will enjoy the hunt for the hidden objects buried within the layer of recycled plastic pellets. Alone or with friends, everyone will enjoy spinning it, shaking it, and twisting it until all the objects are found. Can you find the hidden pennyﾅ?